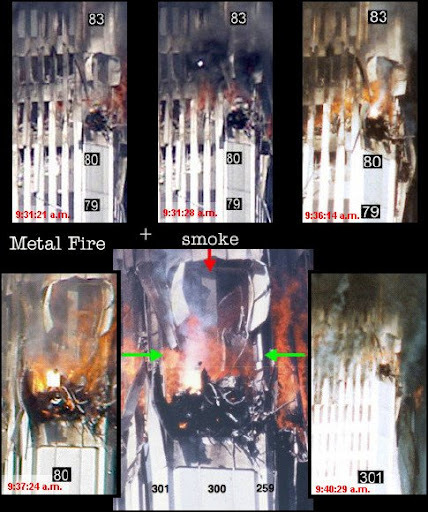 When an image of a square-shaped "metal fire" at WTC was brought to my attention in 2007 by poster "Foxx" at physforums.com, I thought it was probably just an anomaly caused by sunlight reflected off an aluminum panel. According to NIST, however, and several corroborating photographs, I was wrong. There was a metal fire. Since NIST provides no feasible explanation to account for it, I will attempt to do so. (3) a stream of molten iron. All the salient features of thermite/thermate can be seen at the 81st floor of the south tower in the minutes preceding its collapse. "The intense fire in the northeast corner opening of the 81st floor is still present. An unusual flame is visible within this fire. In the upper photograph in Figure 9-44 a very bright white flame, as opposed to the typical yellow or orange surrounding flames, which is generating a plume of white smoke, stands out. The intensity of this flame is considerably brighter than normal flames. It was easily identified in numerous photographs and videos shot from long distances at which the surrounding "normal" flames were not visible. The brightness of the flame, along with the white smoke, suggests that some type of metal is burning. Aluminum will burn, but in normal fires it usually melts instead because the metal surface is protected by an oxide layer that must be breeched before ignition can take place. Aluminum oxide melts at high temperatures (2054C) that are not typically reached in normal fires. There were limited quantities of other metals on the aircraft that might also burn. 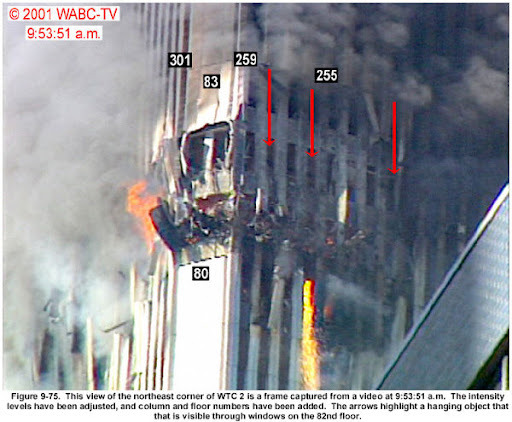 Whatever the metal, the ignition of a metal fire is an indication of the significant heating of debris that took place in the northeast corner of the 81st floor due to the prolonged intense burning in this area following the aircraft impact." So if it looks like a duck, and walks and quacks like one too, it probably is.